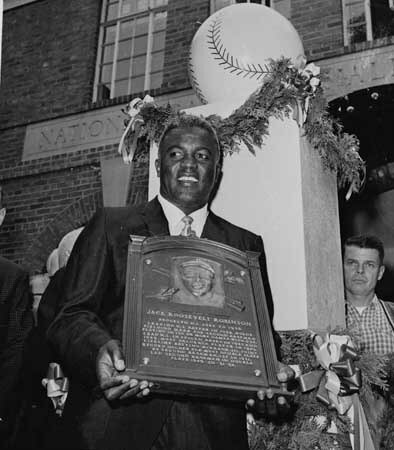 In his first year of eligibility for the Baseball Hall of Fame in 1962, Robinson encouraged voters to consider only his on-field qualifications, rather than his cultural impact on the game. 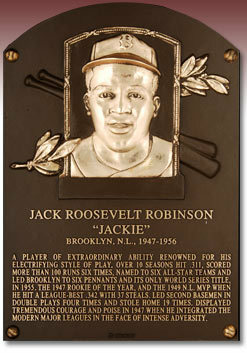 He was elected on the first ballot, becoming the first African-American inducted into the Cooperstown museum. Jackie Robinson, the first Black player to break the color barrier in professional baseball, was inducted into the Baseball Hall of Fame on this day. Robinson first played with the Brooklyn Dodgers on April 15, 1947. He signed his historic contract with the Brooklyn Dodgers oil October 23, 1945. Robinson played all 10 years of his major league career with the Dodgers, had a .311 batting average and was the catalyst for Brooklyn pennant victories in 1947, 1949, 1952, 1953, 1955 and 1956. Robinson was born in Cairo, GA.